The Tetraodontidae are a family of primarily marine and estuarine fish of the order Tetraodontiformes. 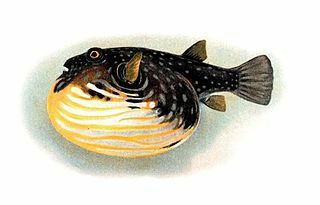 The family includes many familiar species which are variously called pufferfish, puffers, balloonfish, blowfish, blowies, bubblefish, globefish, swellfish, toadfish, toadies, honey toads, sugar toads, and sea squab. They are morphologically similar to the closely related porcupinefish, which have large external spines. The scientific name refers to the four large teeth, fused into an upper and lower plate, which are used for crushing the hard shells of crustaceans and mollusks, their natural prey. Tetrodotoxin (TTX) is a potent neurotoxin. Its name derives from Tetraodontiformes, an order that includes pufferfish, porcupinefish, ocean sunfish, and triggerfish; several of these species carry the toxin. Although tetrodotoxin was discovered in these fish and found in several other aquatic animals, it is actually produced by certain infecting or symbiotic bacteria like Pseudoalteromonas, Pseudomonas, and Vibrio as well as other species found in animals. Zooplankton are heterotrophic plankton. Plankton are organisms drifting in oceans, seas, and bodies of fresh water. The word zooplankton is derived from the Greek zoon (ζῴον), meaning "animal", and planktos (πλαγκτός), meaning "wanderer" or "drifter". Individual zooplankton are usually microscopic, but some are larger and visible to the naked eye. 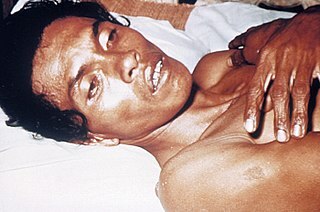 Vibrio vulnificus is a species of Gram-negative, motile, curved rod-shaped (bacillus), pathogenic bacteria of the genus Vibrio. 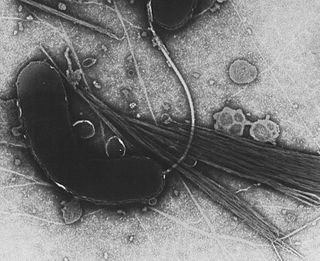 Present in marine environments such as estuaries, brackish ponds, or coastal areas, V. vulnificus is related to V. cholerae, the causative agent of cholera. Aliivibrio fischeri is a Gram-negative, rod-shaped bacterium found globally in marine environments. A. fischeri has bioluminescent properties, and is found predominantly in symbiosis with various marine animals, such as the Hawaiian bobtail squid. It is heterotrophic, oxidase-positive, and motile by means of a single polar flagella. Free-living A. fischeri cells survive on decaying organic matter. The bacterium is a key research organism for examination of microbial bioluminescence, quorum sensing, and bacterial-animal symbiosis. It is named after Bernhard Fischer, a German microbiologist. Vibrio harveyi is a Gram-negative, bioluminescent, marine bacterium in the genus Vibrio. V. harveyi is rod-shaped, motile, facultatively anaerobic, halophilic, and competent for both fermentative and respiratory metabolism. It does not grow below 4 °C. V. harveyi can be found free-swimming in tropical marine waters, commensally in the gut microflora of marine animals, and as both a primary and opportunistic pathogen of marine animals, including Gorgonian corals, oysters, prawns, lobsters, the common snook, barramundi, turbot, milkfish, and seahorses. It is responsible for luminous vibriosis, a disease that affects commercially farmed penaeid prawns. Additionally, based on samples taken by ocean-going ships, V. harveyi is thought to be the cause of the milky seas effect, in which, during the night, a uniform blue glow is emitted from the seawater. Some glows can cover nearly 6,000 sq mi (16,000 km2). Vibrio natriegens is a Gram-negative marine bacterium. It was first isolated from salt marsh mud. It is a salt-loving organism (halophile) requiring about 2% NaCl for growth. It reacts well to the presence of sodium ions which appear to stimulate growth in Vibrio species, to stabilise the cell membrane, and to affect sodium-dependent transport and mobility. Under optimum conditions, and all nutrients provided, the doubling time of V. natriegens can be less than 10 minutes. In the laboratory, the growth medium can be easily changed, thus affecting the growth rate of a culture. V. natriegens is commonly found in estuarine mud. Thiosulfate-citrate-bile salts-sucrose agar, or TCBS agar, is a type of selective agar culture plate that is used in microbiology laboratories to isolate Vibrio species. TCBS agar is highly selective for the isolation of V. cholerae and V. parahaemolyticus as well as other Vibrio species. TCBS agar contains high concentrations of sodium thiosulfate and sodium citrate to inhibit the growth of Enterobacteriaceae. Inhibition of Gram-positive bacteria is achieved by the incorporation of ox gall, which is a naturally occurring substance containing a mixture of bile salts and sodium cholate, a pure bile salt. Sodium thiosulfate also serves as a sulfur source and its presence, in combination with ferric citrate, allows for the easy detection of hydrogen sulfide production. Saccharose (sucrose) is included as a fermentable carbohydrate for metabolism by Vibrio species. The alkaline pH of the medium enhances the recovery of V. cholerae and inhibits the growth of others. Thymol blue and bromothymol blue are included as indicators of pH changes. Bacillus pumilus is a Gram-positive, aerobic, spore-forming bacillus commonly found in soil. Vibrio furnissii is a Gram-negative, rod-shaped bacterium. Its type strain is ATCC 35016. V. furnissii is aerogenic, and uses L-rhamnose, L-arginine, L-arabinose, maltose, and D-mannitol, but not L-lysine, L-ornithine, or lactose. It has been isolated from patients with gastroenteritis, bacteremia, skin lesions, and septicemia. ↑ Reilly, G D; Reilly, C A; Smith, E G; Baker-Austin, C (2011). "Vibrio alginolyticus-associated wound infection acquired in British waters, Guernsey, July 2011" (PDF). Euro Surveill. 16 (42). PMID 22027377. ↑ Noguchi, T; Hwang, D F; Arakawa, O; Sugita, H; Deguchi, Y; Shida, Y; Hashimoto, K (1987). "Vibrio alginolyticus, a tetrodotoxin-producing bacterium, in the intestines of the fish Fugu vermicularis vermicularis". Marine Biology. 94 (4): 625–630. doi:10.1007/BF00431409. 1 2 3 4 5 6 Longo, Dan, et al. Harrison's Principles of Internal Medicine 18th edition. McGraw-Hill Professional, 2011.